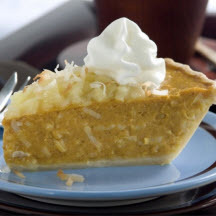 Pumpkin pie goes tropical with the addition of coconut and an easy pineapple topping. Combine sugar, cinnamon, ginger and salt in small bowl. Beat eggs in large bowl with wire whisk. Stir in pumpkin and sugar mixture. Gradually stir in milk until blended. Stir in coconut. Pour into pastry shell. Bake 15 minutes. Reduce oven temperature to 350°F (175°C). Bake 45 minutes, or until knife inserted in center comes out clean. Cool on wire rack for 2 hours. Meanwhile, combine pineapple and cornstarch in small microwaveable bowl or measuring cup until well blended. Microwave on High 1 minute, or until thickened and bubbly, stirring after 30 seconds. Cover; refrigerate while pie is cooling. Spoon evenly onto center of cooled pie, leaving some pumpkin around edge visible. Sprinkle with toasted coconut. Serve immediately or refrigerate until ready to serve. Just before serving, garnish top of each slice with whipped topping. Nutritional Information Per Serving (1/8 of recipe): Calories 348; Fat 6g; Saturated Fat 1g; Trans Fat 0g; Cholesterol 62; Protein 36g; Sodium 2003mg; Carbohydrates 40g; Sugar 5g; Fiber 0%.